Secrets. Of the seven, which do you consider the most thought-provoking? Chima Obinna: Passion is the most thought-provoking. The idea of this book began when I started coaching my son. Part of that process was for me to understand how good he was. There is a very thin line between being a coach and being a father. Do you remain the father or the coach? I asked myself if I were to step aside as a father and only be a coach, would this player be any good? CO: Yes. If I looked at how good my son is compared to other kids on the team, I’d have to look at his level of potential. I would have to look at him from an angle as a father you would say that he was the best player on the team. You begin to favor that particular player. On the other hand, you have to understand that this is my son. As a father, what can I impart on my son? Relating to sports, you’ll hear a lot of people say the word ‘potential’, and you hear of stories of teenagers wasting or using their potential. It’s not only about having potential, but also about using that potential and channeling it. You have to find yourself before you can bring somebody else in. RS: That’s a powerful question for a 10-year-old. processes. 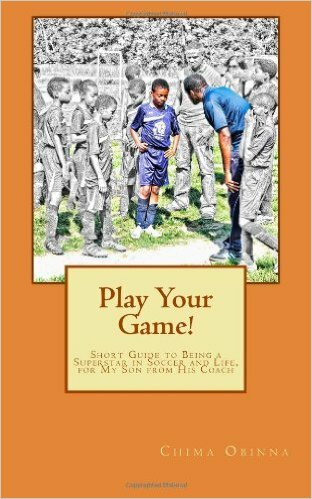 Much of the book is a conversation piece with my son and after a game. I would say the most important of the seven principles is self-awareness. What makes a person stand out among the seven billion people on this planet, what is their starting point? What are their beliefs, heart principles, and core values? What their passion is and how they define the difference between passion and expression. Passion and expression are two different things. RS: You refer to them as heart principles. Do others call them core values? CO: Yes. Finding out what you are passionate about is one thing, but then you have to figure out how to express that passion which is another thing. For example, if someone says, “I’m a teacher. I like to teach.” That is not your passion. That is your passion’s expression. All of our occupations, everything that we do physically in the world, affect the expression of our passion. Those are just expressions. For me, I want to empower kids to find their passion and as they grow older, to continue discovering it and using it to express so many different things in so many different ways. I refer to myself as a “past-renaissance man.” I dabble in a lot of different things. I write, I am a project manager, I do all of these different things and I ask how do you bring them all together into one passion? You have to find that. I wanted to empower children and help them arrive at their fullest potential. Everything that happens in life is something that they have to keep on learning and growing – and you keep on trying to reach – in – no matter what, regardless of their status, education, or where they are at that particular point in time. RS: You are helping them pull out the very best of who they are – the core. Regardless of where they go, they will know this is and not be influenced by external circumstances. No matter how the world turns, we remain unique. It’s our signature. Part of this evolution and growth process is to start when they’re young. Most times we provide self-help for adults but adults are more set in their ways and have beliefs that are too hard to change. RS: The title “Play Your Game” is so powerful. Do the kids you teach know about your book? RS: When they hear you say, “play your game” on the field, what does that mean to them? “Discipline and respect!” After a while it wasn’t enough to say ‘discipline and respect’ but how do you get the kids to take what they’ve learned on the field home. I told them to look at all of the trees and the parents, and to make the trees move when they scream because we want the field and everybody to hear what they scream. Sports are competitive, sports create passion and sports are fun. There are so many aspects of life that come into play when kids are facing certain situations. First you have yourself, then you have the goal and then there are obstacles in-between. To get from where you are to your goal, you circumvent obstacles. You can go through, around, under, or avoid them altogether. Kids face the same types of obstacles in games that they face in life. So you tell them they can move forward – but no one’s going to just let them have their way. There’s going to be obstacles and they have to be aware of these things. Apart from these external things, you have yourself to contend with which will determine if you move forward, backward, or stay the same. Now in this moment, a kid running down hesitates at this point. A coach or parent that is aware notices this hesitation and calls out to them, because they want them to remain in that moment where they’re, at this point, almost on top of the world. They want the player to remind themselves to ‘just be me, and play the game’. The more they repeat the mantra, the more they can play within themselves, and not be affected by anything around them. Just as in life, people concentrate on their work but yet they have these cultures, beliefs, or superstitions that stop them from moving forward even though they know they should. If you make a decision, don’t procrastinate – just move forward. If you make a mistake, learn from it and reflect. Think about you and how you’re going to impact the world with what you’re doing because you have made a move. My belief is that nature is abundance. If you’re not moving forward and fulfilling your passion or purpose – you’re stagnant. You’re dead! RS: You are helping to cultivate young entrepreneurs. but also that they can impact the world. They’re here to do something. It has to empower them to aspire to reach beyond themselves to impact the world. There are billions of people in China, and just in the world – how do you stand out? RS: Getting them to understand that they can – one in seven billion – is the challenge. Even as adults, we doubt ourselves sometimes. CO: Yes. For kids, they do not yet know about this big world. I teach my son that on his team of ten, find the difference between him and his nine teammates. We have two sets of twins on the team, this is a co-ed team. First, I asked him what twins were. Then, we established that the two twins are supposed to be the same, but [really] what is the uniqueness or difference between them? He told me one thing observed was the twin girl being more mature than her brother. The brother is taller and stronger, but he’s less coördinated than the girl so he has ‘clumsy feet’. So he’s now noticing that they’re twins, but they are actually not the same. Realizing that you can talk to them as people, recognizing they’re twins, look-alike, and came into the world together, but are unique and have to impact the world in their own way. Before you even step out to say what it is you’re going to do – who are you? That’s the first step for an individual, and as adults we lose that. Outside we have conformed because we don’t want to be different, and when we decide to be different we go far left. There is self-help for adults. For me, even though I can teach this for adults, I don’t want to lose the kids, to wait until they’re 18 to have to go through the process that we’re going through – teaching them love, character, self-reliance and self-respect. Why not start now? RS: It’s all relevant. We know that sports and education are intrinsically connected. In what ways have you seen sports transform youth that you teach? Not just on the field, but in terms of confidence or self-assurance? CO: When I started coaching, on the sidelines as a parent, I couldn’t stay still. I’m more a teacher than a coach. I’m not a preacher. I’d rather teach. When our first season ended we didn’t win any games because most of the kids were new. We decided to take the kids indoors; we call it winter soccer. The turf is short and so everything is fast. Now picture a team beating another team 20 to 0, what do you think the morale of the zero team should be? Low, crying, demoralized. Not my kids. They said, “Let’s do this again!” We’re teaching them eternal characteristics. 20-0 is the same as 1-0; you lost no matter the count but it’s not about winning. It’s more about how well you played. We would ask them what they thought about the game. Some would say they didn’t play hard enough. That is self-awareness. We would ask why they didn’t play hard enough. They would say the kids were too fast, and maybe they had trained longer. We would then ask what they needed to do in order to get there. They would internalize and respond. Outside of the game, they must have some self-regulation to get better. When we teach the team, we tell them that the team cannot get better if the person doesn’t get better. It doesn’t matter how good a team should be it starts from the inside-out. The chain is only as strong as the weakest link, therefore, that person has to grow for the team to be as best it can be. RS: That’s an excellent course in responsibility; taking responsibility for self and for team. Your background is quite extensive in planning development, implementing, managing, business intelligence, and educational solutions. How have those strategies in your professional life helped you as a soccer coach on the field? CO: Part of what I teach kids is that they are not their job. Even with everyone’s job, they have to be themselves. If you are a mentor, cook, analyst, or project manager, all of that has exude you in whatever occupation that you’re in. When I was growing up, I wondered what I was going to be and I didn’t have me to teach me what I’m teaching my son. I was born in the U.S. but grew up in Nigeria, so I went to high school there. Growing up, we had a lot of dogs – a total of 17. When I was nine years-old I said I came to die for the dogs – I was like the Jesus Christ for the dogs! My older brother asked me what I wanted to be. I said I was going to be a Veterinarian. At ten, all of that changed. I wanted to do something with computers and game development. When I came back to the United States, I joined the military. When you pledge into the military, you take exams that check your aptitude. I scored highest in math and science. RS: Was that when you discovered your strength? CO: Perhaps…I knew what my strength was, but knew that it wasn’t in math or science. But I knew that I was a good learner. RS: To be a good teacher, you must first be a good student. CO: I’m a better student now than when I was as a kid. I didn’t want to put in the effort to get the accolades. My sister was an honor roll student. I pushed myself forward because she was a class behind me, but had an opportunity to skip a grade. That became my eternal motivation. So I pushed myself. At this point, I went into the “internal soul”, the intestines and digestive system, but then I wondered what controlled all of it – the brain; the decision-making part. The digestive system and the internal will not work if the brain isn’t. From computers, I progressed to being a project manager and developing systems for the Maryland State Department of Education under Obama’s race to the top. Part of my work was to define how teachers teach students. How do I impact knowledge as a group and then individually? Not all kids learn the same things, in the same way, and at the same time. As a coach and teacher, you have to ask how you are going to reach little Johnny in the back who might be a little slower. Education relates to everything. The same method works regardless of whether you’re inside or outside of the classroom to reach that unique kid. RS: How do you structure your teaching or change your method or strategy? CO: Part of my work at the Department of Education was to map out that teaching strategy for the teachers to use. When they start teaching, they need to map out where they’re going to get the resources and what resources they’re going to use. If you have 20 kids in your class and one doesn’t get it, how do you teach the one among the 20? Technically, a teacher has to go through these processes to find their way to reach the top one and the last ten percent at the same time. Of course there are classes where people need special intervention. But a teacher has to decide and reflect – and not be so arrogant as to blame the kids. Chima Obinna is the author of Play Your Game, an inspirational short guide to being a Superstar in Soccer and Life. He is a father, head coach, motivator and mass mentor to hundreds of kids who enjoy the game of Soccer in Prince George’s County, Maryland, where he provides enrichment environments for children and adults to be empowered. Part of this process is to uncover children’s talents and create conditions under which they will flourish. He lives with his beautiful wife and two children in Maryland.